Artificial intelligence and Neural networks are appearing in ever increasing numbers of real world applications and are making real money. Indeed, some banks have proven that the failure rate on loans approved by neural networks is lower than those approved by some of their best traditional methods. Also, some credit card companies are using neural networks in their application screening process. Neural networks (MFNNs and SOFMs) form the core of most commercial data mining packages such as the SAS Enterprise Miner and the IBM Intelligent Miner. OCR has become one of the biggest commercial applications of ANNs. Caere Inc, a leader in the market generated $55M in 1997 through OmniPage product line. Google, Facebook, Amazon spur rebirth of industry after decades of little corporate attention. The artificial-intelligence industry, a field that conjures up images of humanoid robots and self-aware computer systems, is making a comeback at Silicon Valley companies like Scaled Inference Inc. The Grid harnesses the power of artificial intelligence to take everything you throw at it - videos, images, text, urls and more - and automatically shape them into a custom website unique to you. As your needs grow, it evolves with you, effortlessly adapting to your needs. Want to add e-commerce? Social feeds? A different layout? The Grid just takes care of it. This is not a website builder. This is your personal AI web developer. Its first masterpiece is the website you're looking at right now. Its next one could be yours. The algorithms expertly analyze your media and apply color palettes that keep your messaging consistent and unique. The Grid also detects color contrasts, automatically adjusting typography color to maximize legibility. A customizable and fully open brain-computer interface platform that gives you access to high-quality brain wave data at about $300 ?! OpenBCI is a versatile and affordable 8-channel EEG signal capture platform built around Texas Instrument’s ADS1299 Analog Front End IC. We designed it to give you access to high-quality, raw EEG data with minimal power consumption. OpenBCI is compatible with any type of electrode (active or passive) and can interface nearly all modern electronics prototyping platforms such as Arduino. OpenBCI is supported by an ever-growing, open-source software framework of signal processing and data analysis algorithms. With this fully customizable EEG data capture system, the data is yours. Join the OpenBCI community and let’s see what we can discover together! The movie Her, directed by Spike Jonze, envisions a future in which operating systems have evolved to learn from our behaviors and proactively look out for our best interests every day. They're our personal assistants, but they've become nuanced to the point that we have no problem calling them our friends. And when a person says they're in love with their operating system, it's not particularly weird. The star of Her is OS1, a new operating system that, when you first launch it, creates a unique persona to best accommodate its user's personality and communication needs. For the film's lonely protagonist, OS1 takes on the name "Samantha" and acts as a personal assistant to control connected technologies like computers, smartphones and TVs. Voiced by Scarlett Johansson, she is also the most human-sounding non-human ever built. Samantha talks and responds naturally like a human, but she can also "like" things like colors, faces and stories. She can "see" her surroundings via webcam, laugh at jokes, make her own jokes, and even exhibit feelings of joy and sadness. She can also recognize and analyze patterns in its owner's recreational habits, relationships and career, and offer beneficial advice without the user needing to ask for it—just like a friend would. Google unveiled its artificial intelligence software this summer that could recognize faces of cats, people and other things by training on YouTube videos. The technology is now being used to improve the results for Google’s products, such as speech recognition for Google Voice. Google’s neural network, which processes data similar to the way the brain works and learns, is based on simulating groups of connected brain cells that communicate with each other. When it absorbs data, the neural network becomes better at processing it and recognizing relationships among the data. That’s what we call learning. Vincent Vanhoucke, leader of Google’s search recognition efforts, told Technology Review that results have been improved 20 percent to 25 percent for speech recognition. Other Google products could benefit too. The fight of producers in the region against diseases in citrus is intense. The attention is mainly focused in three diseases that the European Union considers to be cases worthy of quarantine: scabies, cancrosis and Dark Spot. A single fruit infected and exported can cause a whole shipment to be refused. And the ones able to identify those diseases are few. But the story is about to end, since new advances in artificial intelligence are reaching the citrus sector. Soon a photo will be enough, when sent to a system that can detected if the fruit is infected or not. This is the result of work carried out by experts at the Investigation Group for Signs and Computational Intelligence from the School of Engineering and Hydric Science in the National University of the Coast and CONICET. A heating system with ANN brain allowing for savings of up to 65% on fuel. Researchers at EPFL have developed a system that manages multiple parameters and learns what is best for your house by imitating the most complex computer in the world – your brain. The technology has spun off into a new start-up called Neurobat. The Neurobat regulator has already been installed in several test buildings, among which are one at CSEM, and one in a private villa. Various tests have shown savings in fuel up to 65%, which suggests that savings of around 50% are envisageable in an average building. NASA is using ANN on the spaceship to Mars for managing Green factories! It may seem strange to think of the first manned spaceship to Mars as a flying farm. But consider how difficult it would be to carry all the food a crew would need for what might be a three-year round-trip voyage. Much better to grow your food as you go. AEMC (Advanced Environmental Monitoring and Control) Bioregenerative Life Support project at NASA is using Neural Network to control the on board green machine and keep it humming at peak efficiency. All medications have side-effects from common aspirin to herbal remedies and from standard anticancer drugs to experimental immunosuppressants. However, predicting important side effects, serious adverse drug reactions, ADRs, is with current understanding almost impossible. However, a neural network technology trained with past data could give drug companies and healthcare workers a new tool to spot the potential for ADRs with any given medication. Writing in the International Journal of Medical Engineering and Informatics, at team from the University of Medicine and Dentistry of New Jersey, has developed a new model that tests show is 99.87 percent accurate in predicting adverse drug reactions among 10,000 observations for ADRs. Liver fibrosis progression is commonly found in patients with CHB. Liver biopsy is a gold standard for identifying the extent of liver fibrosis, but has many draw-backs. It is essential to construct a noninvasive model to predict the levels of risk for liver fibrosis. 339 chronic hepatitis B patients with HBsAg-positive were investigated retrospectively, and divided at random into 2 subsets with twice as many patients in the training set as in the validation set; 116 additional patients were consequently enrolled in the study as the testing set. A three-layer artificial neural network was developed using a Bayesian learning algorithm. Sensitivity and ROC analysis were performed to explain the importance of input variables and the performance of the neural network. Praxis Electronic Medical Records Announces New Version 5 With Breakthrough in EHR Documentation. Based on a unique technology called 'Concept Processing,' an intelligent neural network, Praxis EMR becomes progressively faster and smarter by learning from the physician using it. Physicians using Praxis 5 with Datum can chart rapidly with complete freedom while also producing discrete data required by third parties. Researchers at the Mayo Clinic employed Artificial neural networks technique to assist in the diagnosis of a heart infection, endocarditis, related to implanted devices such as pacemakers. If left unchecked, such an infection can be fatal, and treatment is no certain cure. Under normal conditions, this disease has to be confirmed via an invasive surgical procedure, but the ANN allowed them to rule out endocarditis in cases of unknown diagnosis. Nobody has automated the process of diagnosing epilepsy from ordinary EEG data--until now. Around 50 million people suffer from epilepsy--about 1 percent of the world's population, say Forrest Sheng Bao at Texas Tech University, in Lubbock, and a few pals. Bao and colleagues have come up with a system that may have a dramatic impact. Various groups have attempted to automate the process of epilepsy diagnosis using pattern recognition programs to spot the characteristic signature of the condition in EEG data. But these all depend on the EEG-video data that is so hard to get. 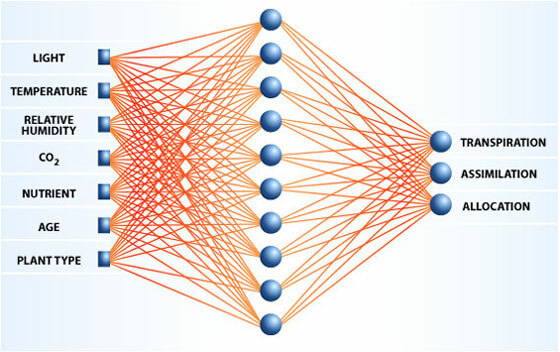 An artificial neural network is a computational model used to analyze behavior in computational science. As opposed to a linear model, this one implies interconnected data processing artificial “neurons,” which establish relationships between input and output, and determine patterns. As industrial-grade Artificial Neural Networks implementation for financial prediction, NeuralCode utilizes Supervised Learning with Multi-Layer Perceptrons and Optimized Back Propagation for complex learning. It uses historical data for predicting or uncovering trends and patterns. Inputs are fed into network with adjustable weights. When output is produced, it is compared with targeted output. Quintura has developed a hosted site search platform built to provide intuitive, visual-based search and navigation for site visitors. Using a dynamic tag cloud to search deeper into an area, Quintura hopes to engage users in “site search far more than ever before, resulting in additional page-views and click-throughs.” Such a notion will be appealing to web publishers who can add Quintura’s hosted solution for free. In order to find the right candidate, Artificial Intelligence (AI) search is being utilized by whereismyboss.com, an online recruitment agency. AI builds analytical and predictive models on candidates’ profile. Once a resume enters the AI database, AI searches the apt candidates’ profile based on pattern search and match and delivers 95% accurate results. AI segments a particular candidate’s resume based on specific criteria which makes the retrieval process quicker during search. Predictive technologies are used to score the candidate most compatible for the job. Intelligence Realm Inc. has recently completed a simulation of 100 billion neurons, the estimated size of the human brain. The simulation used distributed computing and involved over 4000 computers, 3000 volunteers, 10000 processors, 180 TB of data and lasted for a couple of months. This was the first simulation that bypassed the 100 billion level and used database files to store the data. The simulation is one of the first steps in a long-term project that is aiming to build a large-scale artificial intelligence by reverse engineering the brain. Kamatoz.Computing announced version 2.30 of its multi-functional passwords storing and management software suite using Neural Networks. PassMonster is a feature packed passwords management software that offers strong 256 bit passwords data encryption never seen before in passwords management software as well as totally customizable skinable interface layout adding a touch of style. PassMonster is intended both for individuals and enterprises who would like to safely store the increasing number of passwords, pin-codes, serial numbers etc. The demand for biomarkers continues to rise, as does the number of vendors providing tools for this field. As one Natural Selection provides computational tools using neural networks for gene expression analysis. a neural network-based upright frontal face detection system. A retinally connected neural network examines small windows of an image, and decides whether each window contains a face. The system arbitrates between multiple networks to improve performance over a single network. The Cat Attack, a pet toy for Cats, uses the latest research in chaos theory and complex systems to emulate the movements and personality of a cat's favorite prey. 'virtual mouse' technology utilizes algorithms based on a six-dimensional coupled (map) system modeled on the neural network of a real mouse. Using template matching and neural-network software IVS have engineered an automated system to log and monitor car-frame VIN (vehicle identification number) numbers for the Nissan plant in Sunderland. The numbers provide a unique vehicle reference for tracking of service records and stolen vehicles. Smooth real-time data delivery for demanding applications such as digital video has been a thorny problem for broadcast over IP networks due to the high variability of network traffic conditions. The packet sizing problem in IP networks is getting a new twist from non-linear neural network theory developed at SmartPackets, Inc.
SurfControl Web and Email Filtering system uses neural network technology to classify URL & Email content and block the traffic based on easily customisable rules. Mars Express is equipped with an identification system based on Artificial Neural Networks (ANN), which enables fast and precise mineral identification from the parameters. The program, written in C++ language, models a learning vector quantization (LVQ) network. Mitek Systems is a premier provider of check imaging software and check fraud protection solutions for the banking industry. Mitek develops recognition technology using advanced neural networking techniques and deploys this expertise in fraud prevention, check, financial document and forms processing applications. Fair Isaac Corporation (NYSE:FIC) is the preeminent provider of creative analytics that unlock value for people, businesses and industries. The company's predictive modeling, decision analysis, intelligence management, decision management systems are utilizing Neural Networks. HNC Software helps financial services firms acquire and retain profitable accounts, as well as effectively manage risk. Captiva Software provides input management solutions that optimize the processing of information across the enterprise. Neural network technologies is used to extract critical data from invoices and transfer that information to ERP, accounting and document imaging systems. NeuroChess is a chess program which learns from a combination of self-play and observing expert play. Its search algorithm is taken from gnuchess, but its evaluator is a neural network. The purpose of this project is to train an Artificial Neural Network to control a vehicle around a racing track. The track is defined by a few basic waypoints which are interpolated using splines to create a smooth track. The user drives the car around the track and the collected information is used to train the neural network. After the neural network is trained we let it control the vehicle. In response to the growing recognition that better systems are needed to ensure network security, Psynapse Technologies has developed Checkmate Intrusion Protection System, a next-generation smart-security product that sets a new standard for intrusion protection technology. To find new ways for wafer process improvement based on the analysis of large amounts of data, information processing with artificial neural networks can be used. A specific type of network, the self-organizing map (SOM), is the candidate. ANN speech recognition chip, Sensory Inc.
Sensory Inc. have used neural networks to create a speech recognition chip, which is currently being used in Fisher}Price electronic learning aids, and car security systems. The artificial brain developed using CAM-Brain Machine is intended to control the behaviors and locomotion of a quadruped kitten robot that is called "Robokoneko"